Research & Development | Mee Industries, Inc.
A company-wide commitment to research & development enables Mee Industries to continuously optimize and enhance the performance of our MeeFog™ systems. Our fully equipped 3,000 sq. ft. research facility is dedicated to fogging research across a wide and expanding range of applications. Initial air temp and humidity. Concentration of water droplets in the air stream (active radius). 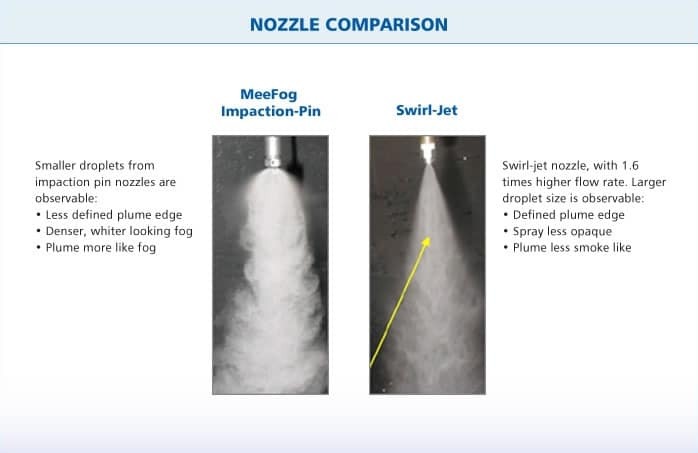 The MeeFog Nozzle creates 20 micron droplets shown to be more efficient at evaporation. Impaction-pin nozzles consist of a smooth, short, straight-through orifice with an impaction-pin located above the orifice. When the water jet hits the impaction-pin, it is separated into a conical-shaped sheet. In the case of a swirl-jet type nozzle, an internal swirl chamber is used, which forces the water to exit the orifice tangentially to the axis of the orifice so that a hollow cone pattern is formed. The internal frictional losses (performance loss) associated with the swirl chamber in a swirl-jet nozzle are greater than those of an impaction-pin nozzle with a smooth, short straight-through orifice. In other words, a swirl-jet nozzle uses more energy to form the conical sheet of water so the sheet has less velocity and is not -stretched- as thin. Given two nozzles with the same operating pressure and orifice diameter, the nozzle with less internal losses (e.g. ; Impaction Pin) will generally make smaller droplets. By their nature, high-pressure water atomization nozzles produce a wide spectrum of droplet diameters. 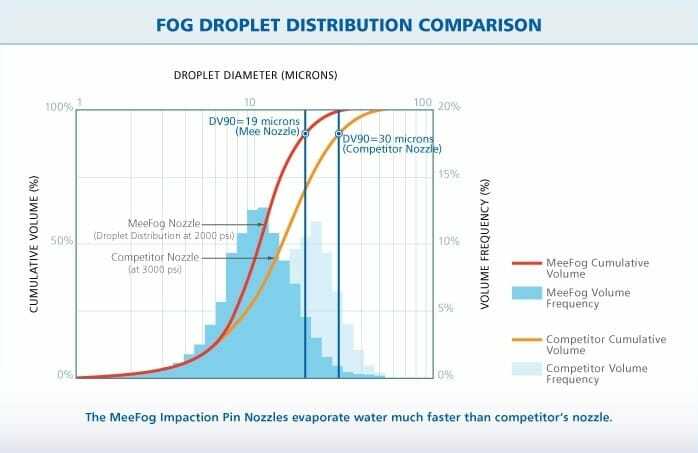 There are two generally accepted statistical methods used for quantifying (and qualifying) the characteristics of inlet fogging nozzles. This number defines a droplet diameter for which 90% of the mass flow of water is less than. 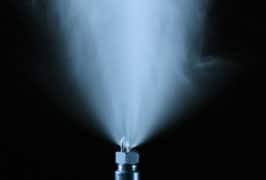 It is helpful when one wishes to look at the possibility of the fog spray collecting in the inlet ducts or impacting on compressor blades. 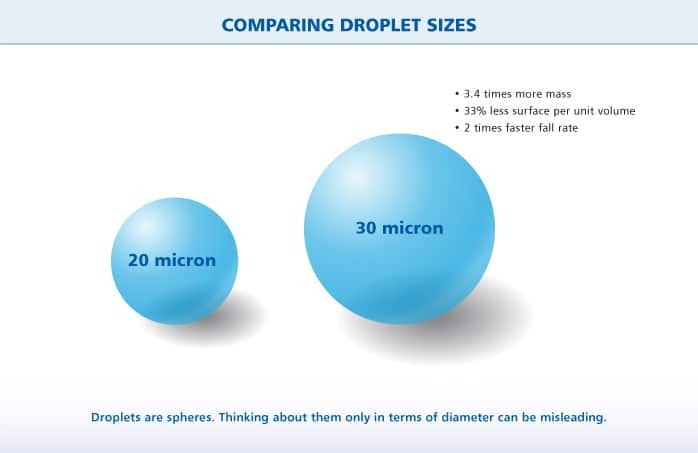 In the above example, less than 18 microns means that 90% of the mass flow of water is in droplets that are 18 microns or less. This number is used for defining the spray from nozzles that are used for evaporation type processes because evaporation time for a given droplet is a strong function of the ratio of volume to surface area. When short dwell times are available (in a turbine power generation inlet duct, for example) this is a very useful design parameter. 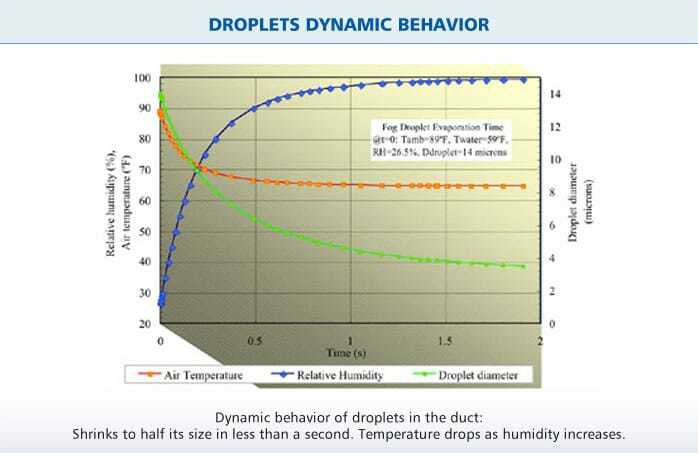 These two statistical measurements of droplet diameter (DV90 & SMD), as well as the location of the measurement in the spray plume and other measurement conditions such as airflow velocity are of primary significance for gas turbine inlet-air cooling. Armed with the above numbers, and assuming they represent the characteristics of the entire water mass flow of the fog nozzles being compared, not just a center section, a buyer can make an informed comparison of different fogging systems. The advent of Laser Particle Analyzers makes it possible for qualified scientists to quickly and accurately measure droplets, but there is no industry standard for applying such devices. 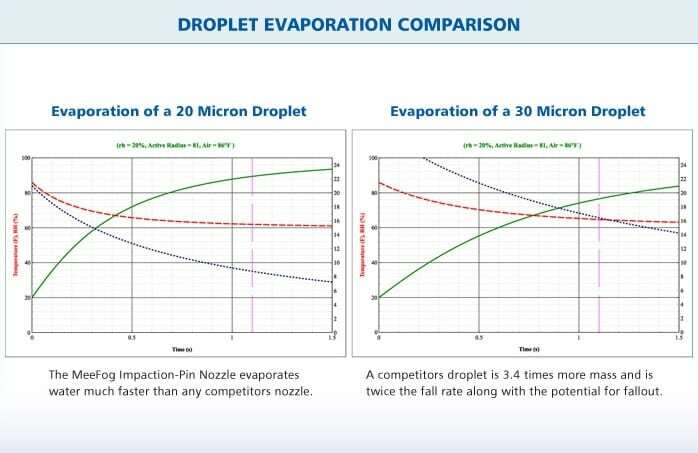 In order to get meaningful numbers, it is necessary to measure droplet size at many points across the spray plume and to weight these numbers based on the mass flow of water at each point. Ambient temperature should be between 70 and 100F. Relative humidity should be close to saturation (90 to 95%). Water temperature should be between 60 and 90F. Nozzles should be tested at their design pressure (as defined by the nozzle OEM). Mee Industries Inc. is committed to a research & development program designed to continuously optimize and enhance its MeeFog™ cooling systems. 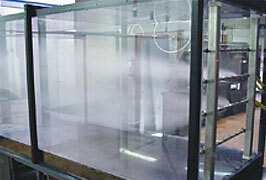 A fully equipped research facility is dedicated to fogging research. This includes a 35 ft., 6000 ft/min. (11.5 m. 1829 m/min) wind tunnel specially designed to analyze fogging flow in gas turbine intake ducts, state of the art laser scattering measurement devices to monitor droplet behavior, and other analytical tools and software. Droplet collision-bounce-coalescence and shattering dynamics. Droplet flow and interference dynamics. Optimization studies on nozzle array placement. Wind tunnel to study droplet kinetics and thermodynamics in gas turbine inlet ducts. This wind tunnel provides dynamic similarity to gas turbine inlets. Facilities such as these set Mee Industries apart from the competition. To better understand the concepts of power augmentation, it’s helpful to review the thermodynamics and dependency of inlet temperature and the effect it has on output and efficiency. 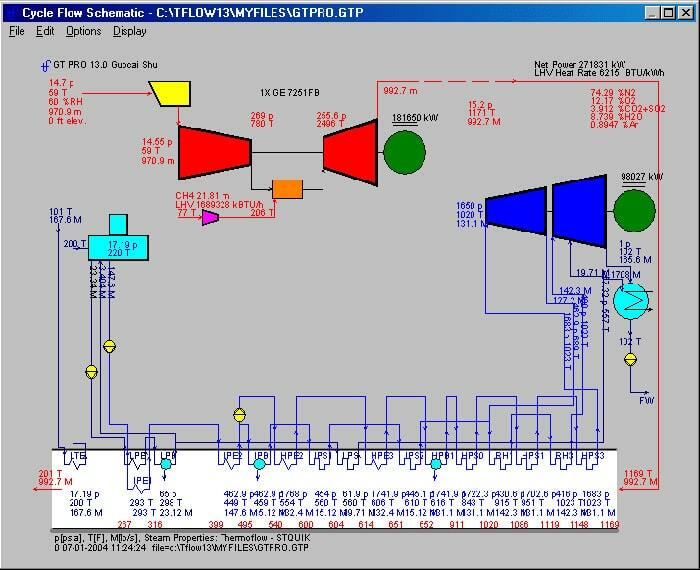 These design parameters are arrived at by simulating the existing situation at the plant, climatic conditions, budget limitations, power output expectations, and project economics. Installed Cost In Terms of Incremental Power Increase. Amount of Power Gained By Means of Cooling. Fuel Costs and Costs of Incremental Power. Projected O&M Costs For The System. Potential Impact on Existing Emissions licensing. Computer modeling of customer’s specific site to calculate performance boost. 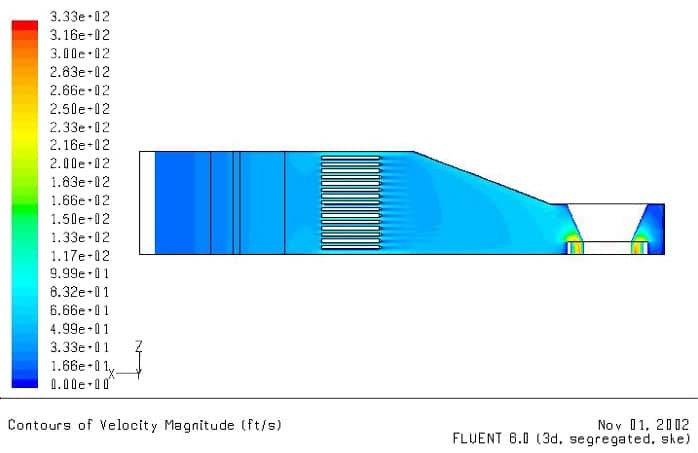 CFD simulation of customer inlet duct behavior for optimization of MeeFog nozzle arrays. CFD studies minimize problems and ensure uniform distribution into the gas turbine inlet. Optimal location of nozzles and their angles are derived by CFD studies.